Corazon is the perfect little sweater to perk up your winter, and a special treat for Valentine’s Day with all its hearts. The pdf contains two versions of the pattern -- 3/4 sleeves in a standard length (shown) and full sleeves with a longer bodice. 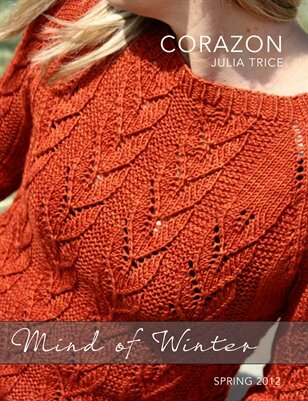 The pattern is suited for intermediate lace knitters. Lace instructions are both written and charted. The pattern has been professionally tech edited to reduce the possibility for error, but if you have questions or believe that you have found an error, please contact me. finished measurements 27 (30, 32 ¼, 35, 37 ¾, 40, 43, 45, 48 ½, 53 ¾)” 68.5 (76, 82, 89, 96, 101.5, 109, 114.5, 123, 136.5) cm bust circumference. yarn Long Sleeve Version 4 (5, 5, 5, 6, 6, 7, 7, 8, 8) skeins SweetGeorgia Superwash DK in “Cayenne”; 256 yds / 234 m per 115 g; 100% superwash merino wool. Three-Quarter Sleeve Version 4 (4, 4, 5, 5, 5, 6, 6, 7, 7) skeins SweetGeorgia Superwash DK in “Cayenne”; 256 yds / 234 m per 115 g; 100% superwash merino wool.